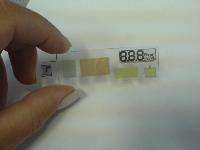 (PhysOrg.com) -- Paper-thin sensors that use the latest technology in miniaturization and printing could revolutionize the way point of care testing is carried out for cholesterol and lead to further applications and developments of the technology. The state-of the-art sensors will analyse and display results taken from a blood sample and will include a printed battery and mobile phone interface on a paper-thin disposable device. The project to develop smart integrated miniaturised sensors (SIMS) is being led by Professor Tony Killard at UWE Bristol as part of an FP7 funded program with four European partners: University of Liverpool ;DCU (Dublin City University); VTT; and Alere. The research draws on cutting edge technology in biotechnology, electroanalytical chemistry, materials science, electronic and production engineering and brings these together with advances in print technology to develop a single disposable point of use test. Point of care tests are already widely used - for example, over a billion strips for testing glucose levels for diabetes patients are already produced each year. The new application takes this concept to a new level, by building into a single strip a number of functions that include a nanobiosensor, printed display, printed battery and mobile phone interface. The strip itself will do the test, calculate the result and offer a means of communicating or relaying this information via a mobile phone. All this will be printed on to a paper-thin disposable device. Professor Tony Killard explains, The focus of our research is to bring the different elements together in a single device that can be produced on a mass scale. The physical integration of the elements is key to the success of the device. These 'point of care' tests and devices, if mass produced, can make health care technology more accessible to a wider population and improve the management of health conditions. Elevated cholesterol is a major risk factor for cardiovascular disease, the major cause of death in most countries of the EU and estimated to cost the EU economy nearly 200 billion/year. This type of test could be self administered and would enable a person to see if their cholesterol levels were high, or to see if the drugs and/or lifestyle changes they were doing to lower their cholesterol levels were working. Other applications of this technology would include using this in remote locations to facilitate diagnosis and treatment where laboratory facilities are not available. With the mobile phone interface, the results can be translated into a text message, recorded and processed. Printing is a key technology for creating such mass produced devices and we will use a combination of photolithography, screen and ink jet printing and lamination. The SIMS device will use the latest organic printed electronics, avoiding the use of silicon, which is less sustainable. Through this project we want to push the technology of printed electronics towards novel application in health care and diagnostics. The SIMS device will be low cost, disposable and maintenance free. It aims to bring together key technologies into a single relevant concept that will have benefit for people and health. Since there is still no known correlation of total cholesterol, if less than ca. 300, with anything, what contribution to improved health will this device make? what contribution to improved health will this device make? This is more about the system (low-cost printing a complex device) than about the specific cholesterol test. I hope they are not an ecological problem, though.